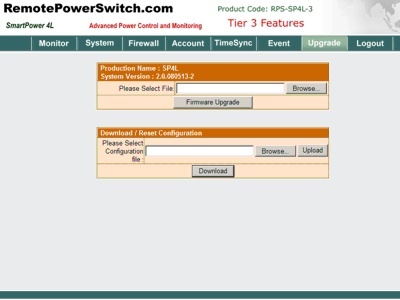 Screen Shots and RPS-SP4L Configuration. -Tier 3 Version Allows Admin and three additional user accounts. 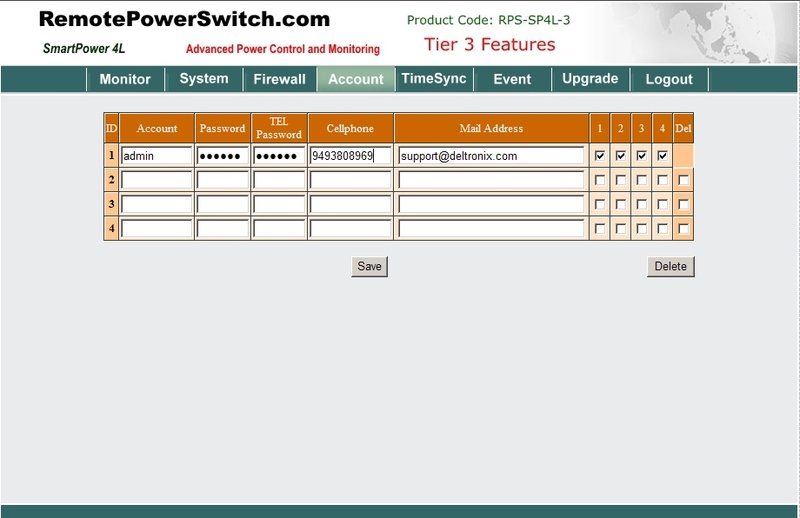 Account: This is the user account name required to access the RPS-SP4L Remote Power Control Device. allowing the browser to run scripts. If you are not allowing scripts to run, look for the security bar that pops up in your browser window, right click and select ALLOW for this function to work properly. and Tier 2 Versions of the RPS-SP4L device. 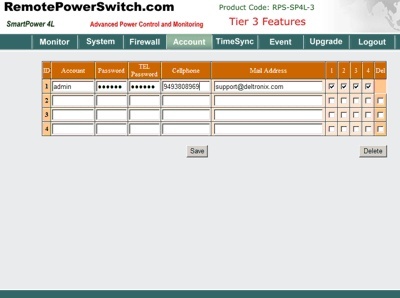 You can also select which power ports the specified account can control by checking off the appropriate box. Remember to click the SAVE BUTTON to write the information to the remote power switch. Equipment Date: The system date of this Remote Power Control Device. Equipment Time: The system time of the Device. Sync with PC: If you choose this item, the equipment time and computer system time will sync. PC Date: The current Computer System Date. PC Time: The current Computer System Time. 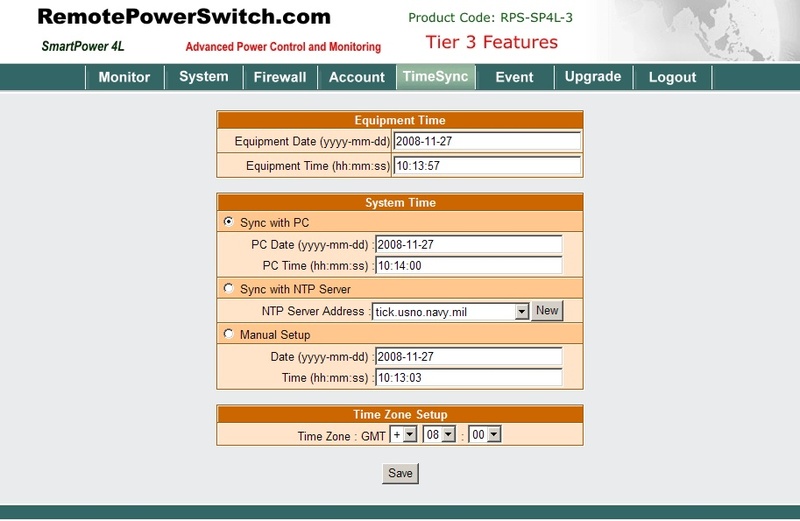 Sync with NTP Server: If you choose this option, the RPS Device will sync with the specified NTP server. You may also add a new NTP server by selecting the NEW button and following the prompts. 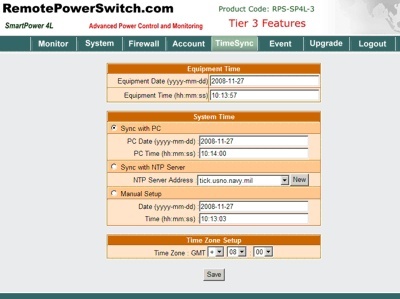 NTP Server Address: Several NTP servers options are available. You may also add a new NTP server by selecting the NEW button and following the prompts. For proper functioning of the unit, the time should be correctly set with one of these options. 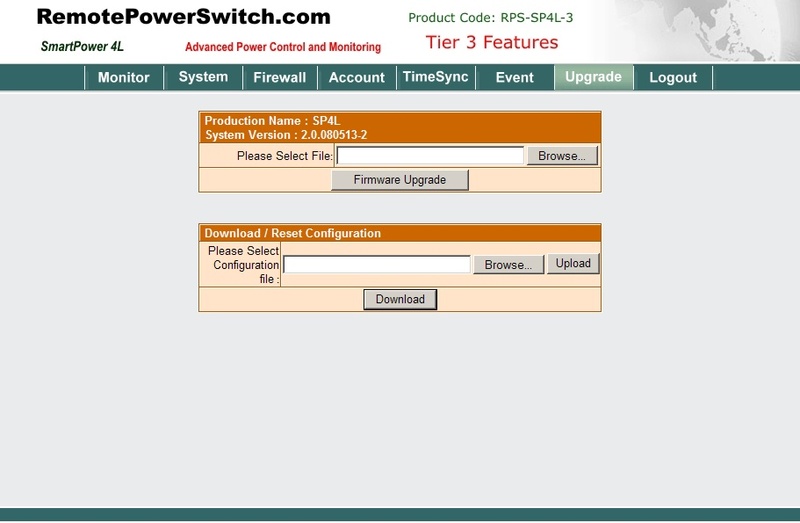 Remember to click the SAVE BUTTON to write the information to the RPS-SP4L. 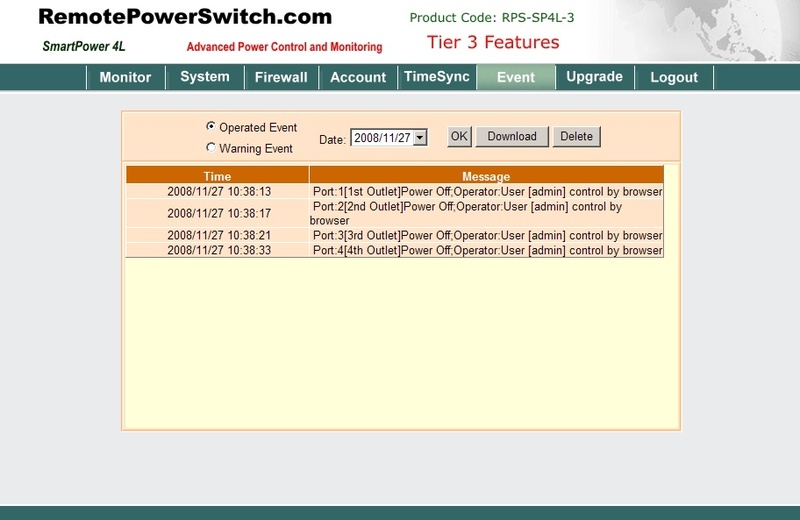 The RPS-SP4L maintains a log file of all activities and warnings. The log rotates on an approx. 5 day basis. 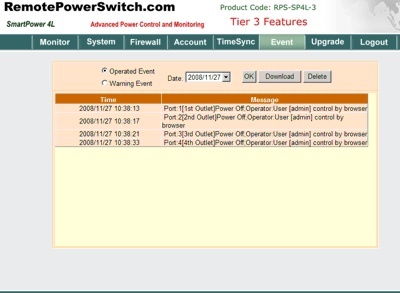 You can view, delete or download the remote power control units activities. Your Firmware/Software can be updated from this menu. You will be supplied a firmware file keyed to your unit when an update occurs. There will be an online system shortly which will allow for firmware updates. The latest firmware is always installed on your unit prior to shipment. You may also backup your configuration by selecting the DOWNLOAD button. Once saved, you will have the ability to upload this configuration file at a later time using this menu. The LOGOUT button will end your session with the remote power controller.